The Swindle is a side-scrolling stealth action game, and the first console release for indie studio Size Five Games. With a combination of stealth, platforming, and even roguelike elements, does The Swindle deliver or was this heist doomed from the start? Read on to find out! You begin The Swindle as the scruffy looking male protagonist in the image above. Your mission is to pull of the biggest heist, The Swindle. You have 100 days to pull it off and in the meantime, you will need to rob and steal your way to the top. Before you can take on The Swindle, you need to upgrade your airship. The airship acts as your main base and transports you from one mission to the next. The airship will need to be upgraded before you can attempt the final mission, and the upgrades are not cheap. The Swindle is a heist game at heart. You select a map, and attempt to grab all of the loot without getting caught. Money is usually found in small amounts just laying on the ground, waiting to be claimed by a more deserving owner. The big loot comes from the computer terminals that need to be hacked to claim the reward. Money lying on the ground will usually only be around $40, but hacked computers can spit out nearly $1000. It may seem like a lot, but when the airship upgrades cost upwards of $20,000 you begin to notice the daunting task ahead. 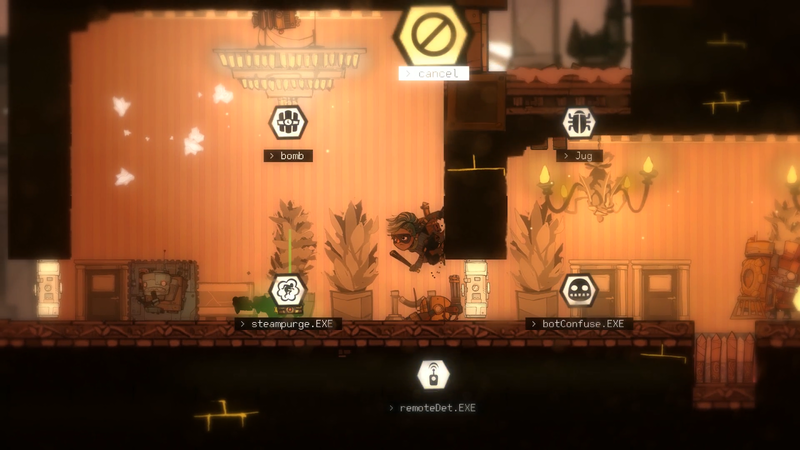 In order to progress in The Swindle, you will have to repeatedly rob the same location. However, the roguelike elements keep it from being too monotonous. Each level is randomly generated with different layouts, guard types, guard locations, computer locations, and so on. To an even further extent your character is also randomly generated. If you should die during a heist, you respawn as a new character. The character really has no bearing on the game though, aside from an achievement or two. During heists, you will primarily be platforming more than actually sneaking around. Guards have a simple vision cone which sound an alarm if you get caught. There is also only one type of attack, which is just smacking enemies with a blunt weapon. To get past most enemies you will have to wall climb, jump, and otherwise platform your way around them. I found this to be extremely frustrating as I ended up dying more by platforming than enemies actually catching me. Falling from too high of a point, slightly landing in a spike pit, missing a wall to slide down, and even enemies that once knocked out can still kill you if you jump on them. I expected a stealth game with stealth mechanics, instead The Swindle is a platformer where “jump behind him” is the only “stealth” mechanic. There are plenty of upgrades to increase your tools and abilities. But as I stated before these upgrades are not cheap. In total there are six heists in the game, each with a bigger potential reward if completed. I was able to average a few thousand dollars on a successful attempt of the second mission. But the average upgrade is $5,000, with the highest being a whopping $400,000. Add the element of time as you only have 100 days to complete the final mission, and I quickly found myself scrambling to steal a few scraps of money. Each mission you complete, or each time you die, is one day lost. With about 20 days left, I only made it to the third mission. The achievements and trophies for The Swindle will not be very easy to obtain. “Spring-Heeled Jack” tasks you with completing the game with your starting thief. As I previously stated, one death and a new thief will be randomly generated for you to continue. In other words, you have to complete the entire game without dying. “MoneyBags” tasks you with having $5 Million in your bank account. A ridiculous number for the position I was in, but I assume the later missions have a much bigger payout. The “You’re a Mean One” requires you to rob a house on Christmas Eve. And yes, that is the actual Christmas Eve date of December 24th. Unless your willing to do some console manipulation, you won’t be getting that one any time soon. The Swindle is a mixture of the stealth, platforming, and roguelike genres and frankly I didn’t like the way any of them were implemented. It was very frustrating to not have more stealth mechanics to complete the heists and be forced to use subpar platforming. The upgrades a plentiful, but I mostly died by falling or missing a jump which would result in all of the current haul depleted and one more day ticked off the counter. It was an endless cycle of needing better upgrades, dying because I didn’t have better upgrades, then starting a new mission without good upgrades. It resulted in a not so great experience. What I Played: 4 hours, 106 heists, reaching the third “New Belgravia” stage.